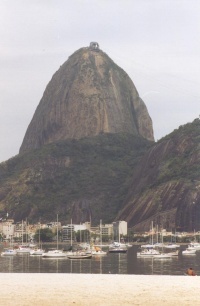 During my trip to South America in September, 2002, I stayed in Rio de Janeiro, Brazil for a few days. It was definitely the wrong time of year. It was dreary and rainy the whole 4 days. I also visited Foz do Iguaçu (Iguazú Falls). The Iguaçu National Park is a UNESCO World Heritage Site. A lot of the pictures from Rio are very hazy. That was because of the lousy weather, not because of the camera. In August 2018 I visited Brazil again. This time I flew into Salvador and stayed there overnight. The next day I took a bus to Lençóis in the Chapada Diamantina National Park for three nights. After the visit to Lençóis I took the bus back to Salvador for another overnight. The next day I flew to Campo Grande for a visit to the Brazilian Pantanal for three nights. 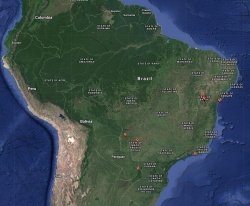 After the Pantanal visit I continued my trip to Paraguay and then to Bolivia.